This is a simple Idle Heroes wiki, game guide and tips for beginners. The more advanced advice you will get from the hight level players during the game, so choose a guild carefully, pick one that will help you develop your ultimate heroes team. Guide contains descriptions of Campaign, Best Heroes, Characters, Hero Fusions, Altar, Summoning, Casino, Prophet Gate, Arenas, Trials, Shops, Items, Upgrades, Challenges, Quests, and Guilds. Idle Heroes main screen interface. 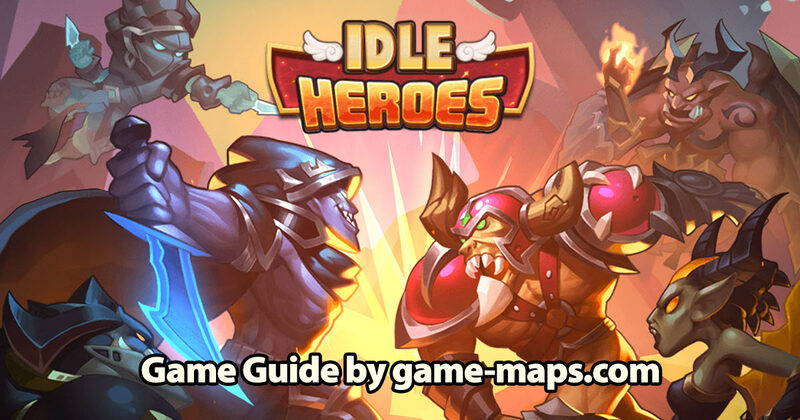 Idle Heroes is MMO RPG Idle Video Game for mobile devices, available on Android Apps on Google Play and Apple App Store for iOS since June 2016. To play it on PC, you can use an emulator. The game is in the free to play model, but it is difficult to play it without spending real money. Try to get at least VIP3 status and Monthly Card to gain access to additional features. If you spend even a small amount of money (under $50) the game becomes much more interesting and balanced. Thanks to Wolf Pack Guild form S52 for support with making this guide. 01 Campaign, idle battle zone. This is your storage for equipment, artifacts, shards and materials. Here you can check what you have. Hero List show all the heroes you have. Gallery is a kind of encyclopedia of all the heroes in the game. Here you can buy Gems and rise your VIP level. Friend List fulfills two basic functions. It allows you to receive and send Hearts to other players and summon and fight the Marauders. Changing the server during the game, you will keep everything but lose the VIP status. Collect all the heroes 3 Stars and above. If you have more then 8 x 3 Star of same kind you can disassemble them. Events in this game are the most important source of interesting heroes and items.